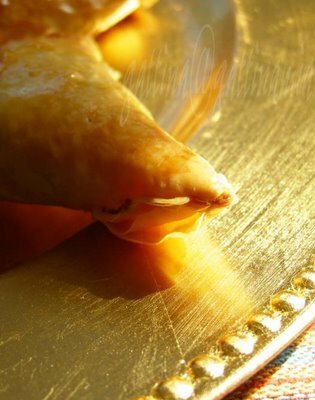 When I first saw Archana's spicy meat puffs, my imagination immediately ran wild... spice and aroma infused in the air, people are anxiously waiting at a local bakery (if a good one, always, is people waiting for the food to come, but not vice versa). Eventually, hot and sizzling juice bursts through the pastries, people rather taking a risk of burning tongue still don't delay the first bit... 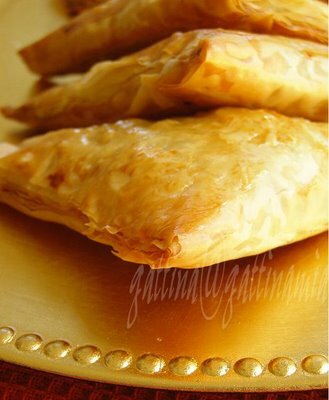 It is hard for me just looking at Archana's beautiful pastries but not making one... Please don't feel frustrated when seeing all that unfamiliar spices stated in the recipe. First, they're inexpensive, and commonly used in other Asian cuisines; it's worth a special trip to Asian store. For the dough, the original uses puffy pastry, but this time I'd like experimenting phyllo sheets . Marinate the meat with diced garlic, ginger, a teaspoon of chicken powder and a pinch of sugar for an hour in room temperature, or overnight in the fridge. Saute onion and diced green chilies with oil over medium heat for about 2 minutes. Add turmeric, coriander powder, garam masala and fennel seed and fry over medium-low heat for a few minutes, let the fragrance release. Add meat, rise the heat to high/ medium-high (adjust from time to time), fry for a few minutes until half cooked. Scoop the meat into a sieve to drain, and cool off. 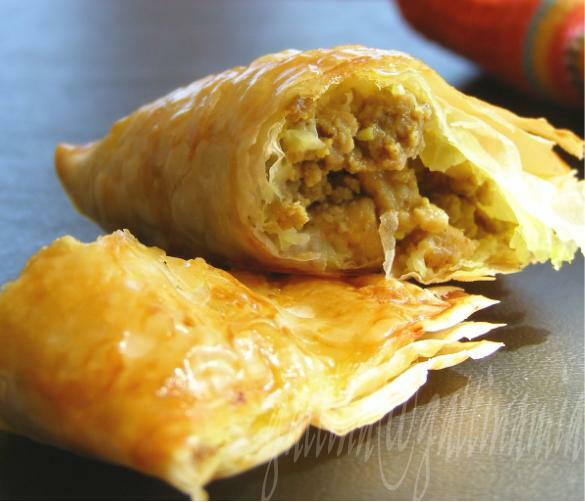 (Follow the pack instruction on how to hand phyllo sheets) . Pile six sheets of phyllo (in between brushed with salted butter) and divide into 4 pieces. Take a quarter piece, spoon in the meat mixture, brush the edges with egg, fold and seal. Repeat to the others. Lay the pastries on a baking tray, and egg wash them. Baked the pastries in a medium-hot oven, 325F to 350F for 15 minutes or until golden brown. Served hot. I love spicy food, make me hugry!! Lovely ! Nice photos too. I am soooo happy that you tried it. aiyo, you are starting another craving for me. throw some over pal! beautiful. Muthia, thanks for your visit! Any spicy food will make me more hugry! Archana, thanks for sharing your lovely recipe! It's a keeper! Angie, I know... my husband ate three of these in one go! Edith, we're both love spicy food! These are very good... I often have them in S'pore and also the curry puffs... with potatos and curry... really good!